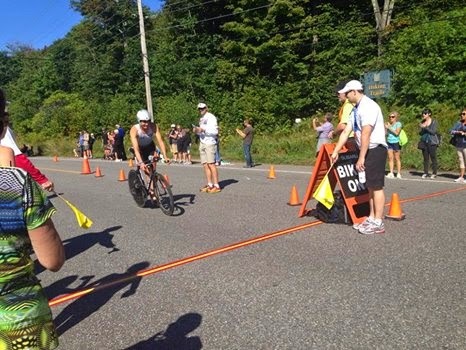 One year ago, I came to Muskoka 70.3 as a self-coached age grouper with one half distance race under my belt and no aspirations of competing at the pro level. I surprised myself with a fifth place finish ahead of most of the pro field. 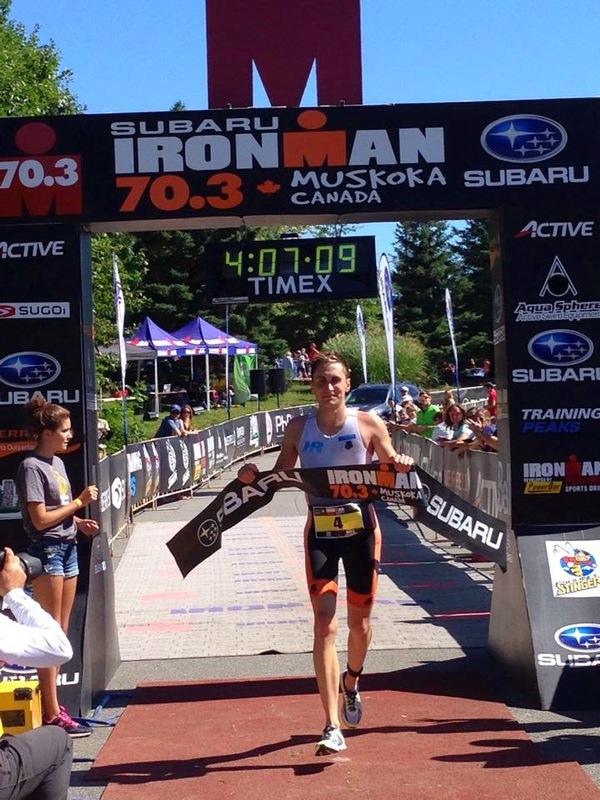 The past year has brought so many positive changes that there was little surprising about claiming my first Ironman 70.3 podium when I returned to Muskoka. It was bittersweet to lose by only a minute (results), but I gained a new appreciation for the focus and willingness to suffer, not to mention the fitness, that it takes to win at this level. I tend to avoid researching and analyzing my competitors prior to races. At this stage, most of the pros I’m racing have more experience and more impressive resumes than me. I prefer to enter races without preconceived notions about who is faster. Nevertheless, certain athletes don’t escape my notice. Richie Cunningham‘s name jumped off the start list. His long career is highlighted by more than ten Ironman 70.3 victories and four top 5 finishes at the 70.3 World Championships. He was building his reputation as scrappy, tough-as-nails racer while I was still in preschool. He was in a different league when we raced at Texas 70.3 in April, winning the race with a 4.5 minute margin over my fifth place finish. However, I knew that I’d come a long way since then, so I marked him as the man to beat in Muskoka. Some personal best swimming during my taper gave me the confidence to line up alongside Richie, 70.3 winner and super-swimmer David Kahn, and short course specialist Tom Eickelberg. At the gun, I managed to get out with the front pack, hanging on for dear life. I worked hard to maintain contact with Richie and Tom, but I didn’t notice a surge around the first turn at 500 m until a gap had formed. I was disappointed to swim alone after that, but my strongest swim start to date shows that I’m close to making front swim packs. My swim coach, Tim Floyd of Magnolia Masters, has accomplished a lot with a fairly minimal mid-season program, typically just 12-16,000 m per week. The key is that I’m in the water six days per week and include at least a little fast swimming every session. I’m excited to really get to work in the pool over the months ahead. 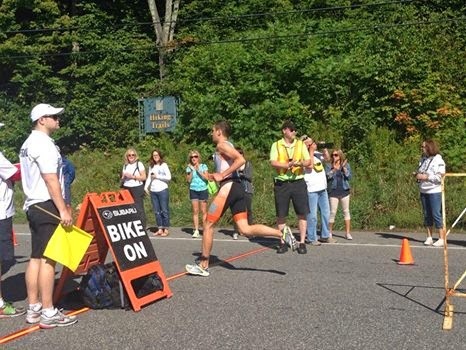 The Muskoka 70.3 bike course is one of the most challenging on the circuit for a few reasons. First, it is 4 km longer than the standard distance. Second, the course has well over 1,000 m of elevation gain in the form of relentless sharp climbs over the distinctive sawtooth terrain of Muskoka. A third factor is the bone-rattling chipseal roads that make up long sections of the course. Recent testing by a Slowtwitch forum member showed that chipseal can double rolling resistance compared to normal asphalt, a speed penalty of about 2 km/h. Many people find that rough roads can also take a toll on power output. Last year, this course haunted my dreams. After a year of work on the bike, I relished the challenge and intended to dominate this ride. No ride is without minor mishaps, but I had an overwhelming feeling of calm, control and confidence. There was no place on earth I would have rather been than turning the pedals, propelling myself towards a success that felt inevitable. The experience was simultaneously intense and peaceful as only racing can be. I overtook Richie before the 30 km mark and set my sights on David up the road. My power meter died after about 50 km, shortly before I took the lead, which didn’t faze me in the least. In fact, it seemed fitting; I was racing for the win, not by the numbers. Blasting through Dorset on my pimped Cervélo P2, aka the “Poor Man’s P5”. I checked over my shoulder and was annoyed to see Richie hanging tight at the legal distance behind me. Coming off the bike with an ace runner like Richie was a situation that I wanted to avoid. So I began to test his defenses with increasingly punishing surges. He matched me on the climbs and the slight draft effect at 10 meters made it impossible to grind him off on the flats. In retrospect, perhaps I should have committed to one serious attack, but I doubt that I could have given that wily old fox the slip! 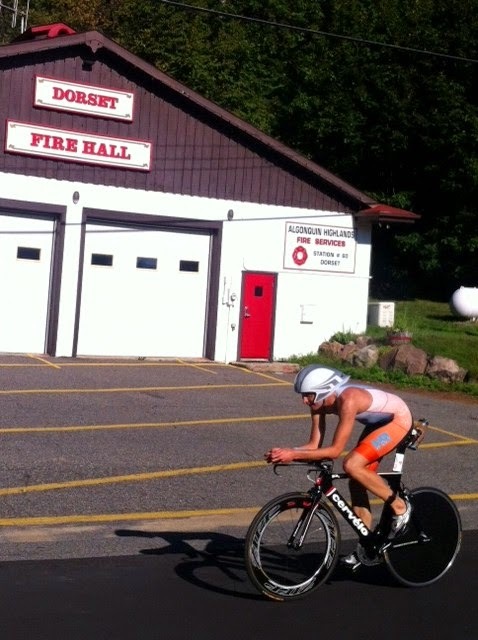 Finding myself first off the bike with the fastest bike split at a 70.3 would have been unfathomable just months ago. But nine months on the CompuTrainer and four months with my brilliant coach, David Tilbury-Davis, have redefined my expectations. I rode over 8 minutes faster holding around 35 W higher power than last year. The run course isn’t nearly as brutal as the bike course, but it’s far from flat and every rise feels significant after that ride. While my swimming and cycling have improved markedly over the past year, my progression with running hasn’t been as clear. One obvious factor is that I’ve learned to ride much harder and leave less in the tank. Another is that I’m still adjusting to some fairly dramatic and overall beneficial changes in my body weight and composition. I raced at ~157 lb/~71 kg (at 6 ft/182 cm tall), around 10 lbs heavier than last season and a full 20 lbs heavier than 2012. Finally, running has not been my focus lately, and simultaneous development across three sports is probably a thing of the past. With Richie just seconds back out of transition, the focus and confidence that I had throughout the ride began to falter. I fully expected him to catch me and was surprised as the kilometers slipped by without any sound of his footfalls. He finally caught me around the 7 km mark, but I could tell that the effort had cost him. I hung with him for over a kilometer before he put in a strong effort that I was unable to match. At that point, I resigned myself to second place. Second was good… my best 70.3 finish yet, I rationalized. After a low point, I looked up the road and noticed that the gap hadn’t grown much. I was encouraged by the wall of spectators in downtown Huntsville and got my head back in the race. Over the remainder of the run, I alternated between refocusing and pursuing Richie, then giving up and retreating inwards. Crossing the line in second, I couldn’t help but wonder if Richie had outclassed me more in his desire to win—even after his many victories—than in his form on the day. Had I given it my all? Would my all have been enough? I can’t say, but I intend to find out next time. My sponsors Giles Atkinson (Keystone Communications), Magnolia Masters, MultiSport Canada, Klean Athlete, Vorgee, Nineteen, CompuTrainer and Altra. My coaches David Tilbury-Davis and Tim Floyd, whose guidance extends far beyond my training. My exceptional homestay host George Crawford. My friend Irina Souiki, who provided live race updates and photos that put Ironman’s consistently pathetic coverage to shame. TriMuskoka, an advocacy group that facilitates these big events. My parents and friends who supported me over the weekend. 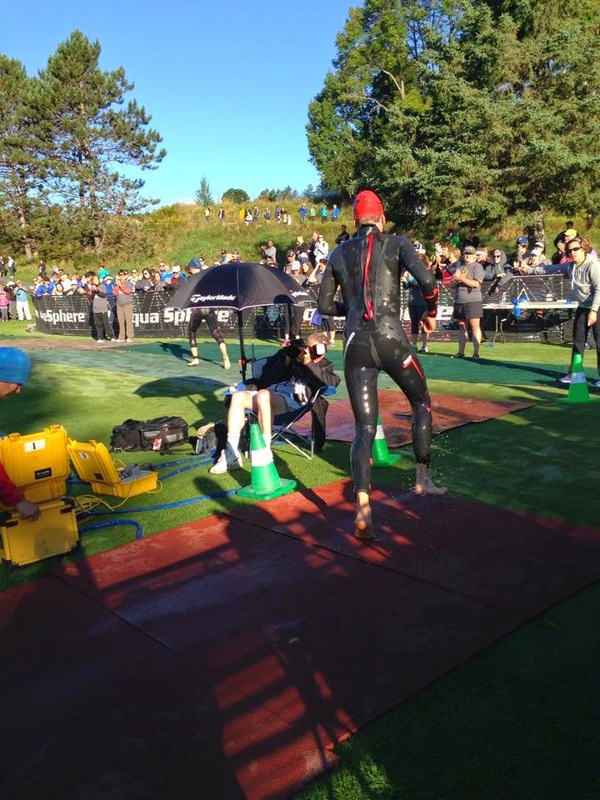 Muskoka 70.3 showcased lots of up-and-coming Canadian talent like my friends Alex VanderLinden, Antoine Jolicoeur Desroches and Chris Balestrini. I’m racing a local sprint this Saturday, MultiSport Canada Lakeside, then a new half distance triathlon the following Sunday, Niagara Falls Barrelman.